Every year, every day, every minute I have a lot to be thankful for. My amazing spouse, my healthy children, my annoying pets- all of it. I am thankful when I wake up that I got another day with these people that I share life with. I love thanksgiving because it really gives us all a chance to reflect on our lives. So often its go, go, go that being forced to be thankful is great. Now as you know we are huge animal advocates. Our animals are just as big of our lives as any other (human) member. They demand so much of our time and money and effort, but they also GIVE so much back to us in love and devotion. We have 5 cats and 1 dog right now, a honest to goodness zoo some days. But you probably understand and have a zoo yourself! So this year while you are being thankful, do not forget your pets! I have been challenged to create a DIY for pets this year on behalf of Big Heart Brands to #TreatThePups and I came up with an easy DIY that anyone can do it home. 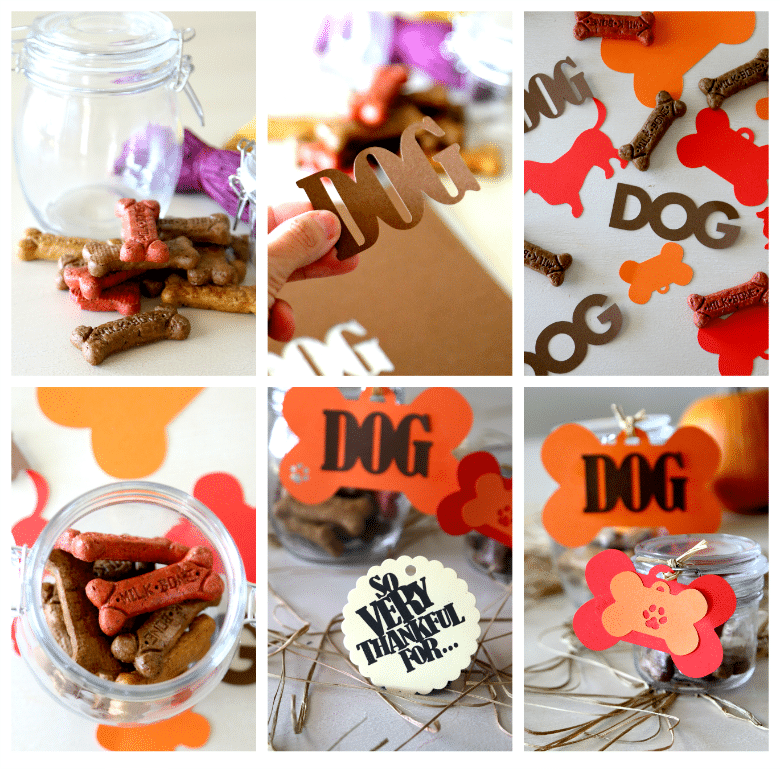 You can use this to display your OWN pups treats or give as gifts to friends and family that show up. 1) With your Silhouette Portrait, create adorable tags by using text and graphics that will easily cut out the shapes you need right from your desktop! Some graphics already have hole punches in theme to attach your twine, but if not, you can simply use a hole punch or cut a slit upon completion. 2) Stack different cut outs in a variety of card stock colors to get a really nice layered and professional look. 3) Simply fill your treat jar up with treats and then tie your tags straight to the jar with a small piece of ribbon, raffia grass (as shown here), or twine. This is a beautiful and simple way to appreciate those around you. We all love our pets, so make sure you pass on some of that love to a family or friend whom can bring home a “Thankful” gift after Turkey Day.